Schedule for New Weekday Walk-In's at all 16 locations! We’re thrilled to share that we’ll be adjusting our schedule to accommodate for walk-ins from Mondays – Thursdays from 5:00pm – 9:00pm! Starting Monday January 8, 2018 our Denver, San Francisco, Washington DC, Mississauga, and Atlanta locations will offer the opportunity to drop in and throw with us! 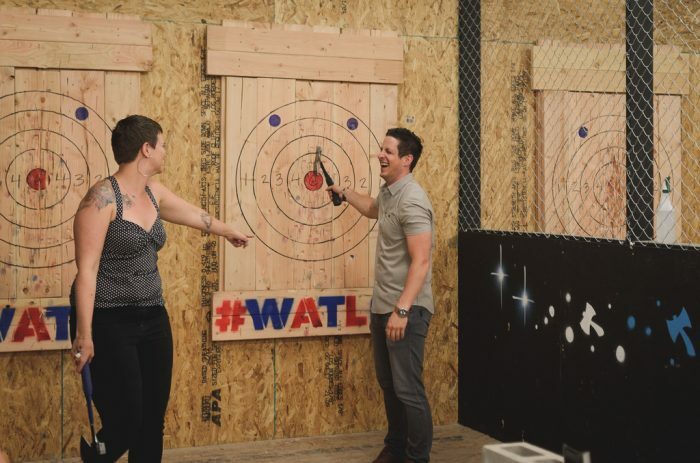 Walk-in axe throwing sessions provide you the opportunity to simply drop in for an ‘open axe throwing’ experience. A communal axe throwing lane is provided on a first come first serve basis. Guests are welcome to just show up and throw with other axe throwers in the community! No reservation, booking or minimum number of guests needed! Our Denver, San Francisco, Washington DC, Mississauga, and Atlanta schedule will be offering walk-ins from Mondays – Thursdays from 5:00pm – 9:00pm. The price of a public walk-in axe throwing session is $10 + tax for each 30 minutes. Each guest is required to pay a minimum charge of 1 hour. Our professionally trained axe throwing coaches will set you up in the lane and will provide a brief instruction before you can begin throwing. Then, it’s up to you and your buddies to count points and keep score or throw just for fun! If you’re looking to book a private axe throwing lane and event book online today!